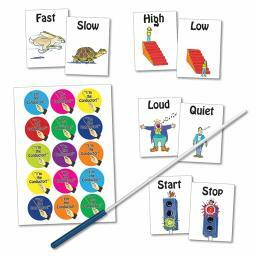 This kit provides a great way to motivate children to understand basic musical skills and concepts such as starting and stopping, loud and quiet, fast and slow. The kit consists of a conductor’s baton, ‘I’m the Conductor’ stickers and 8 amusing and appealing visual representations of instructions. Supplied complete with activity suggestions for how to use the kit in the classroom.